Hi everyone Choc Brown lounge again. 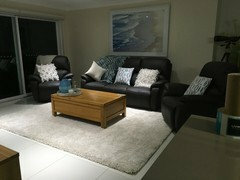 Hi Needing some urgent help, New lounge arrived Yesterday, Choc brown leather, I bought it to compliment choc brown dining room chairs, & kitchen bar stools, It now feels like it is the only thing in the room. We luckily live with lots of green outside and some ocean views from this room. 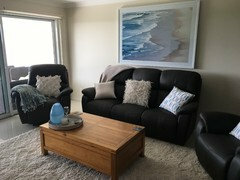 I have a beach picture with white frame on the wall above the couch, we also have light wooden furniture, entertainment unit dining room table and buffet and coffee table, all matching, it is an area that you see the kitchen, dining, etc, a family room. I normal get a lot of compliments on my decor, but I feel this last purchase of this choc lounge has ruined my scope. We are having overseas guests in a couple of weeks, and I feel the rooms looks dull & uninviting. I have tried the orange look, Photos shown I don't like it, I am thinking of the blues tropical's but really do not know where to start! 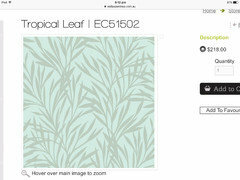 Rug plain or patterned? 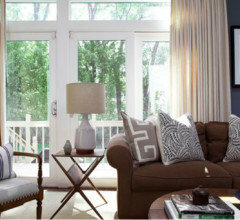 should cushions be plain if a patterned rug? a throw? 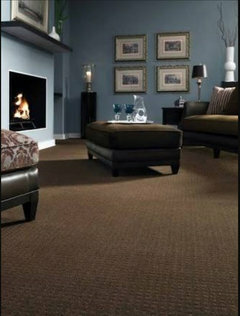 or repaint a wall, Walls are quarter strength Hog Bristle, floor large tiles a slighter lighter colour than the walls. Kitchen cupboards same as floor, with a brown stone top. Has anyone any ideas feel overwhelmed. I am not keen on the orange look. borrowed. Oscuee, Wow thank you for your help & imagination your ideas are fantastic, Where did you source the cushions rugs & white pot from? were they on the internet, or IKEA etc. That choc brown suite really unearthed me, the kitchen bar stools and dining chairs were great in Choc, then the suite just killed it. 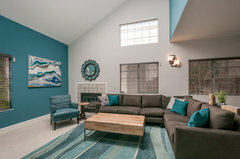 Do you think a wall painted, say the Tv wall, would so the design justice? 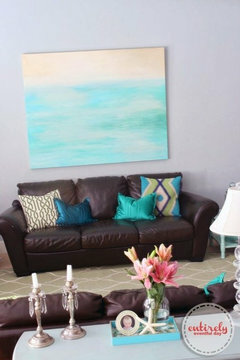 I love colour, but mostly light breezy type colours, & normally I can help no end with decor, but this just froze me! 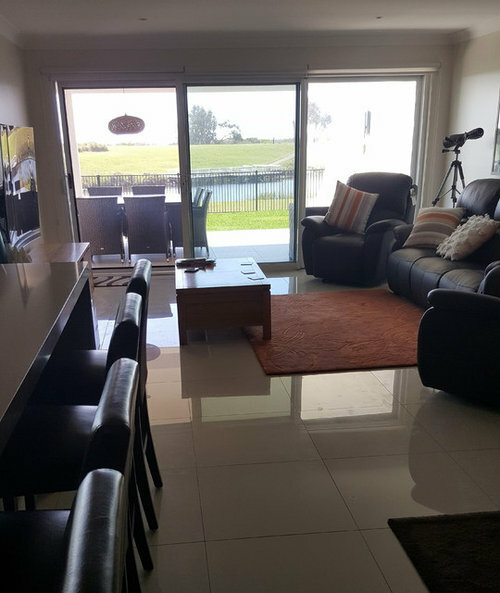 Lounge room decor advice needed. I would paint your bookshelf the same colour as the walls and stuff it with, well, books! 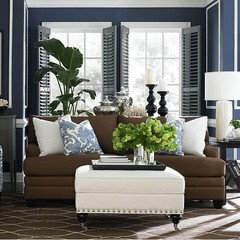 I would paint the built-in corner unit to match and just use it for potplants - ivy that hangs down would look good. As for the coffee table, if the room is small, what I did in our little family room was hunted around and found a large curved hunk of tempered glass from Freedom and it sort of 'floats' and looks invisible in some lights. Seriously, I think the line was called Ghost and was very reasonable (they also had a side table to match). Throw a bit of cherry red around and see how it looks with the creams and the taupes. Here is a pic of the coffee table. Does this rug work with this lounge? 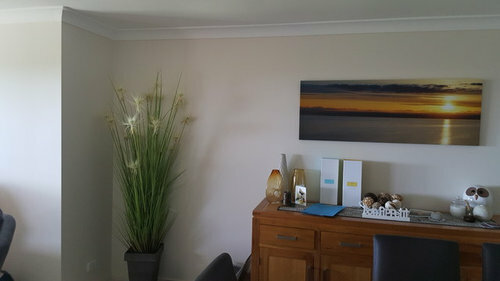 Hi Julie, thank you for your thoughts & ideas, fortunately I can say this is the 1st time I feel stuck with my ideas, I first thought orange, and borrowed a rug and throw from a bedroom, I just did not like it, I want to make the most of the beautiful view we have & try to match the colours of the outside, with either Teals, blues, whites neutrals etc. I am being inspired by the comments & images, & thank you, Could you tell me where your images are from? 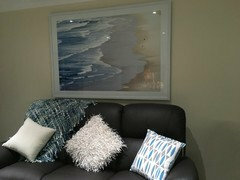 My beach scene was from Oz Design, It was the largest one, as they do a smaller also. Thank you again & Take Care. 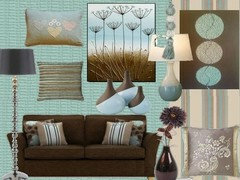 I would go for neutral colours with lots of texture. A few pops of blue would work well with the artwork. 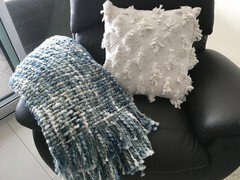 Rugs are from website Rugs of beauty and cushions..most of them from BedBath And Table but Freedom has Good Ones as well, I am glad you like it. 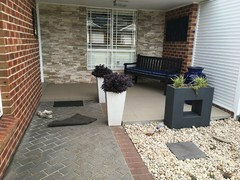 As for the pot plant I just googled it I am sure you will find one maybe Bunnings?? how lucky you are to have such a fab view, don't worry it will all come together, some wonderful ideas from everyone, Pinterest is terrific for inspiration and if you use google (i.e blue rugs ) it comes up with great ideas too, a shop called 'Habitat' they have a website also, ( but if you get the chance visit a shop as it is gorgeous) some beautiful homewares in the colours you are after, soft blues and neutrals and a sophisticated beachy look to match your lovely painting and make the most of that great view, also to tie in with your lovely floors. lucky you. 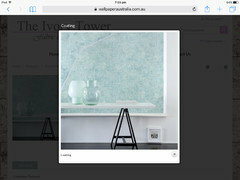 I agree thatlots of textured neutrals (including big rug to soften the tiled floors) with pops of teal or aqua and some greenery would work well in 'lifting' your space and enhance your lovely outlook. 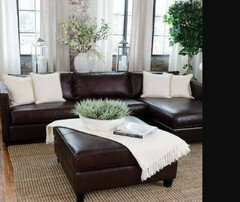 Here's how others have decorated with a dark brown leather couch. So Many thank you's for you inspiration, you have great ideas, my thoughts are now I am beginning to relax about it all. 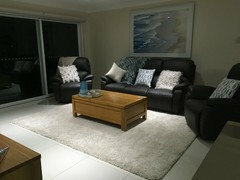 Neutrals as in rug & one cushion to match the sand in the picture, splashes of the blue as in the picture for cushions, and the odd vase, I have 2 lovely white cushions, I would like to use too. I thought you are supposed to group in three's? so rug, cushion, & sand in the picture. I already have a collection of whites & blues on the entertainment unit with a lovely silver shell to match the handles in the kitchen & cofee table, photo below. 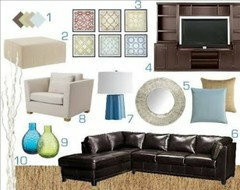 My next BIG question is the wall housing the TV, with the entertainment unit below, keep it neutral or paint it blue?? so unsure. We are retirees and spend our time entertaining and loving our home. Another reason i purchased brown was we have 5 grand children, say no more, The white suite I used to own looked fantastic, & looked so beachy. but it had it's day. 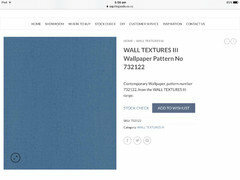 So the Wall, Blue or Grey/Blue or leave alone, and have I thought it right re the above. Thank you for all your help you are marvelous. Our World needs more getting together & enjoying each other. Take Care. Lovely comments and sentiment, sueandave6. 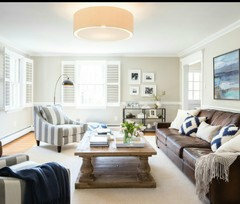 Your white cushions beautiful and textural - use them certainly. I like idea of doing something more with TV wall. I can see it painted a blue-green shade like the colour in your large artwork. 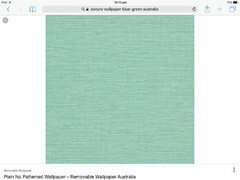 Or blue-green texture wallpaper, one with thin horizontal texture lines running through it. 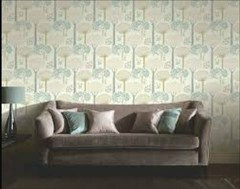 I have just seen the wallpaper that springs to mind...will see if I can locate it. Also, I like your grouping on entertainment unit. You have a good eye for simple beauty. 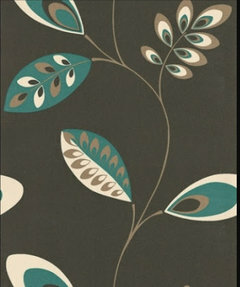 Thank you, I do enjoy working with colour schemes, but wonder what the heck I did buying the brown lounge. 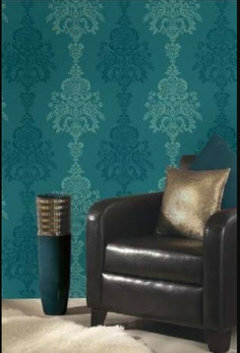 I will be interested to see the wall paper or paint that could just finish it off, or leave it neutral. Thank you so much. Thank you cloudpants Yes they are so lovely, i am looking for something maybe modern, as the whole house has a modern finish, except the lounge that looks a bit traditional. Cannot wait to start shopping! 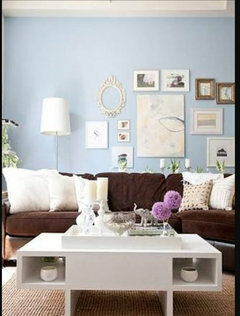 Do you think the wall should be a softer blue, or more of a statement? Cloudpants l love the leafyone last but one, wondering if they do something similar but in a blue, not a teal. Sueandave6, I'm still searching for wallpaper I saw yesterday, but here are a few others. And this one is just for fun. How cool is it?? 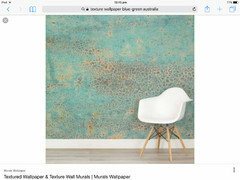 I would love to know too, so l can see different wallpaper & paints with the decor l select. 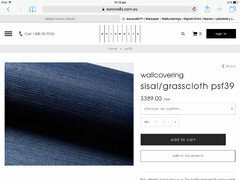 Irene Morresey lovely Navy Allen + Roth grasscloth, l think.it is from USA. I want something available now. It is great thank you again. I love your painting , it is divine you could look at it and find something new in it each day, colours are so restful, great choice for your room. Thank you Julie. 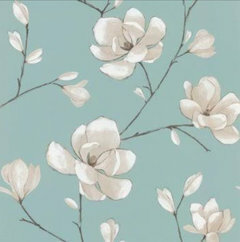 I am now thinking of painting or wallpaper for the TV wall, Irene had found a lovely Navy one, can't find it in Oz. Trying to find something suitable. Thank you for your lovely comments. Try these folks, phone # top of page, although specifies 2-3 weeks delivery, but worth a shot. 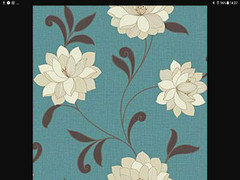 You could also call into a good paint & wallpaper shop as they will have sample wallpaper books you can look through. 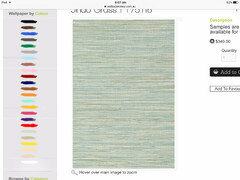 You can check West Elm, IKEA for rugs. 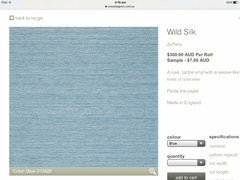 Do you have Overstock or Amazon , or Wayfair in Australia? 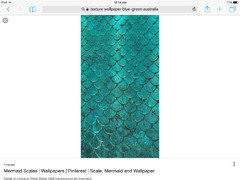 I checked the Bunnings website last night hoping to see some blue grasscloth. 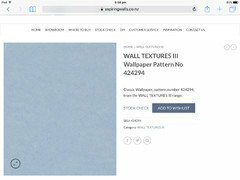 I didn't, but they may stock or can get more wallpapers than their website shows. Worth a look. 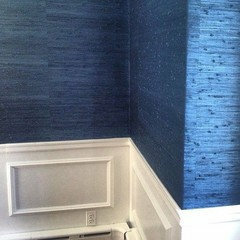 I would paint the walls a navy blue or install navy blue grasspaper. The remainder soft furnishings should create light interiors with off white fabrics and off white textured cushions and throws. 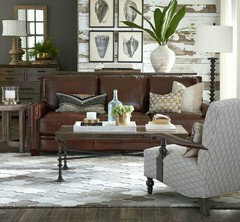 A jute floor rug would be really interesting to pull the brown sofa together. 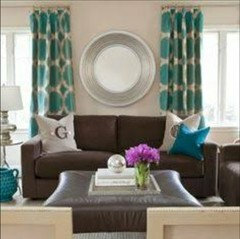 I would even suggest painting the coffee table an off white as well to lighten the room. A high side table with a white lamp would be the cherry on the cake. Just a few simple ideas and hope you will like them? I'm glad you found some things out shopping, Sue. I often get my cushions from Spotlight as they have a pretty good range in all colours, and they don't break the bank. Something white and textured for your coffee table ornament would tie in well. I'd be tempted to find something with seaside theme - similar to the coral ornament on your entertainment unit and about that size. Even a mid-size glass vase/bowl filled with shells and things you have collected might look nice. Paint is the easiest thing to change if you find you tire of a particular colour. I haven't looked at any of the textured paints recently so can't comment on that. I still like wallpaper idea, but you can always do that later on, and go with paint for now. hope things settle for you very soon. Keep us posted! 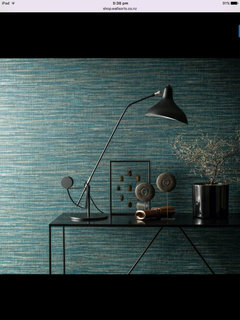 I know you are trying to find a wallpaper with lighter blues than teal, but does this one have too much teal? It has other colours within this design so maybe? 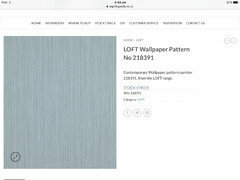 This is from Wallsorts in NZ! 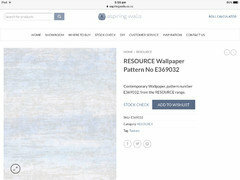 This wallpaper co is in Wellington. They have wide range, a roll calculator and a stock check calculator. Wow, Sue, how lovely it all looks! I really like the rug! 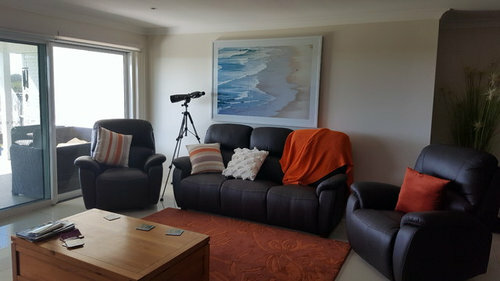 It brightens up the room.i do like the textured throw, but try placing it over the arm of chair nearest sliding doors; I'm thinking it's competing with the beautiful artwork. And place the wheat coloured one on sofa. See what you think about that. The round tray on the table looks so interesting. Well done. Yes l have tried this, the throw is so chunky and heavy annb1997; l had been looking at this throw, for a couple of days, and luckily the shop will allow me to return it. Just not sure. Thank you, lm starting to like the brown suite, it is really comfortable. Thank you for your lovely compliments. Another small project, entrance door is going blue. Not finished yet, a few things to do. lovely, love the throws, they pick up colours in your beautiful painting, I would move tray to centre of coffee table, that way gorgeous vase will highlight blue in painting, so lovely Sue, stand back and wait for the compliments, love it. Your entrance is so inviting and pretty, Sue! 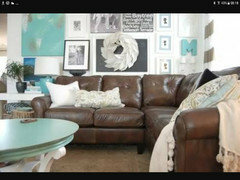 Well, the chunky throw does look better there on the chair, but if you have doubts then go with your gut feeling. Be sure to share snaps of your entry once you have painted the door. Will look forward to seeing it!